There are two things common amongst those who are looking to upgrade their home in Nashville: they want the best value added to their home for the least money, and they want to remodel a room which will most greatly improve their home. Granite countertops are not just a trend due to some fluke, they’re trending because they look great and last for decades when treated properly. When we’re talking about adding value we’re talking about adding materials and objects which either last long, or add to the visual appeal. Granite countertops do both of these things, all while being easy to maintain with soap and water, along with some periodic sealing. Once you have that perfect kitchen countertop taken care of, turn your attention to the appliances. A set of matching appliances adds great value to a home if you’re selling it with the fridge, stove, and washing machine left installed. If you’re not leaving everything, as most take a fridge with them, there is a way that this can still add value: Choose stainless steel appliances for your kitchen. It is easy for a new homeowner to locate a matching stainless steel appliance. One which is sunset orange…may be more difficult! Another benefit of already having stainless steel appliances installed is that they go with any paint scheme chosen. Diversity is definitely valuable! A paint job just may be the easiest and cheapest way to add value to your home. Painting it that perfect color to go with your granite countertop creates a unified and exciting look that the next owner of your home will appreciation. Paint is great at covering up all of those little scratches and wear marks that occur with time. This is where the value comes in as your cabinets look new, even if they have seen a few decades of wear. 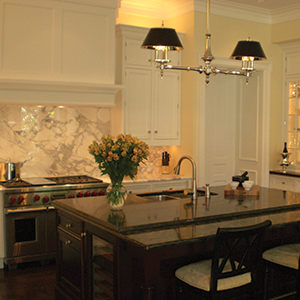 There is no one else in the Nashville or Middle Tennessee area that has helped as many people upgrade their kitchen as the design team here at Stone World. Check out our kitchen gallery for kitchen renovation ideas that add value to homes: notice how many of them center around a striking granite countertop that our team helped locate and install.